During tissue remodeling following injury, cells must rapidly reprogram to withstand the stresses typically seen in a wound microenvironment, including inflammation, loss of extracellular matrix contact, nutrient deprivation, oxidative stress, and hypoxia. Similar stress-induced reprogramming occurs during the progression of tumors, or “wounds that do not heal”. In the context of cancer, cellular stresses (including those induced by cancer therapy) trigger the emergence of stress tolerant tumor cells that display stem-like, drug-resistant properties and an increased metastatic potential. A common marker found on wound tissue and highly aggressive cancers is the integrin αvβ3. In fact, we found that ITGB3 is a stress-inducible gene that, once expressed on the cell surface (as part of the heterodimer αvβ3), leads to stress tolerance where it not only facilitates vascular and epithelial remodeling during injury, but on tumor cells promotes a mesenchymal phenotype characterized by enhanced tumor progression, metastasis and drug resistance. Interestingly, tumor expression of αvβ3 leads to a change in the tumor microenvironment as measured a significant increase in tumor associated macrophages (TAMs) which are known to drive tumor progression while inducing immune suppression. Based on these findings we developed a therapeutic strategy to treat these lung and pancreas tumors by specifically taking advantage of their αvβ3 expression and accumulation of TAMs. This was accomplished with use of a monoclonal antibody (LM609) that not only targets αvβ3 on the most aggressive, drug resistant cells within the tumor, but also binds to Fc receptors on the TAMs. In doing so, LM609 induces a macrophage-mediated antibody-dependent cellular cytotoxicity (ADCC) response leading to the destruction of these highly aggressive tumors and prevents drug resistance when combined with standard of care. By gaining insight into molecular mechanisms associated with tissue repair and cancer we identified a marker common to both pathological conditions that can serve as a therapeutic target to control the most aggressive drug resistant forms of a range of epithelial cancers. 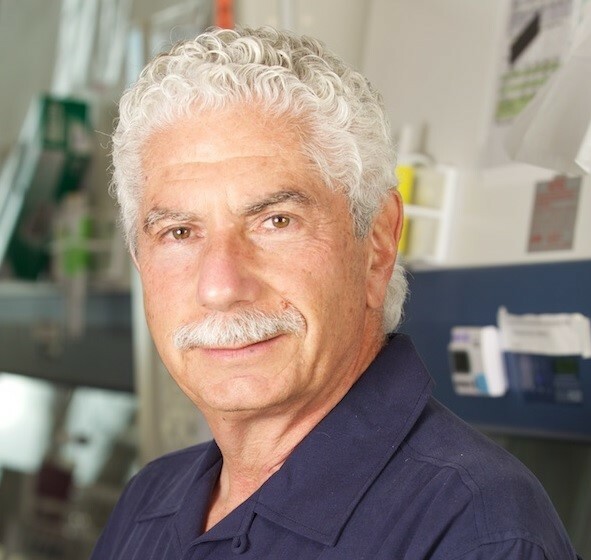 David Cheresh currently holds the position of Distinguished Professor and Vice Chair of Pathology at UCSD. He has made fundamental discoveries on the role that gangliosides, integrins, growth factor receptors and intracellular kinases play in tumor growth, and vascular remodeling. His early work focused on the functional role of the GD2 ganglioside in neuroectodermal tumors. At that time Cheresh discovered the anti-GD2 (now termed Unituxin), which was FDA approved in 2015 for patients with advanced neuroblastoma. He discovered that integrin αvβ3 is specifically expressed on angiogenic endothelial cells where it contributes to the growth of tumor-associated blood vessels and plays a role in the progression of various cancers. Cheresh has developed antibodies, kinase inhibitors and nanoparticles now in clinical development for patients with cancer and inflammatory disease. Most recently, Cheresh has identified how tumor stem cells develop in response to therapeutic intervention or cellular stress. Cheresh and colleagues have identified specific targets that contribute to cancer drug resistance and have begun to develop therapeutics to target these pathways in order to reverse drug resistance and cancer progression.